Helen Adams Keller (June 27, 1880 – June 1, 1968) was an American author, political activist and lecturer. She was the first deafblind person to earn a Bachelor of Arts degree.The story of how Keller's teacher, Annie Sullivan, broke through the isolation imposed by a near complete lack of language, allowing the girl to blossom as she learned to communicate, has become known worldwide through the dramatic depictions of the play and film The Miracle Worker. A prolific author, Keller was well traveled and was outspoken in her opposition to war. She campaigned for women's suffrage, workers' rights, and socialism, as well as many other progressive causes. Helen Adams Keller was born on a plantation called Ivy Green in Tuscumbia, Alabama , on June 27, 1880, to Captain Arthur H. Keller, a former officer of the Confederate Army, and Kate Adams Keller, a cousin of Robert E. Lee and daughter of Charles W. Adams, a former Confederate general. The Keller family originates from Switzerland . Helen Keller was not born blind and deaf; it was not until she was nineteen months old that she contracted an illness described by doctors as "an acute congestion of the stomach and the brain," which could possibly have been scarlet fever or meningitis. The illness did not last for a particularly long time, but it left her deaf and blind. At that time, she was able to communicate somewhat with Martha Washington, the six-year-old daughter of the family cook, who understood her signs; by the age of seven, she had over sixty home signs to communicate with her family. According to Soviet blind-deaf psychologist A. Meshcheryakov, Martha's friendship and teaching was crucial for Helen's later developments. In 1886, her mother, inspired by an account in Charles Dickens' American Notes of the successful education of another deaf and blind child, Laura Bridgman, dispatched young Helen, accompanied by her father, to seek out Dr. J. Julian Chisolm, an eye, ear, nose, and throat specialist in Baltimore , for advice. He subsequently put them in touch with Alexander Graham Bell, who was working with deaf children at the time. Bell advised the couple to contact the Perkins Institute for the Blind , the school where Bridgman had been educated, which was then located in South Boston. Michael Anaganos, the school's director, asked former student Anne Sullivan, herself visually impaired and then only 20 years old, to become Keller's instructor. It was the beginning of a 49-year-long relationship, eventually evolving into governess and then eventual companion. 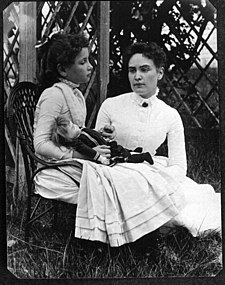 Anne Sullivan arrived at Keller's house in March 1887, and immediately began to teach Helen to communicate by spelling words into her hand, beginning with d-o-l-l for the doll that she had brought Keller as a present. Keller's big breakthrough in communication came the next month, when she realized that the motions her teacher was making on the palm of her hand, while running cool water over her other hand, symbolized the idea of "water"; she then nearly exhausted Sullivan demanding the names of all the other familiar objects in her world. Due to a protruding left eye, Keller was usually photographed in profile. Both her eyes were replaced in adulthood with glass replicas for "medical and cosmetic reasons". Starting in May, 1888, Keller attended the Perkins Institute for the Blind . In 1894, Helen Keller and Anne Sullivan moved to New York to attend the Wright-Humason School for the Deaf and Horace Mann School for the Deaf. In 1896, they returned to Massachusetts and Keller entered The Cambridge School for Young Ladies before gaining admittance, in 1900, to Radcliffe College. Her admirer, Mark Twain, had introduced her to Standard Oil magnate Henry Huttleston Rogers, who, with his wife, paid for her education. In 1904, at the age of 24, Keller graduated from Radcliffe, becoming the first deaf blind person to earn a Bachelor of Arts degree. Anne Sullivan stayed as a companion to Helen Keller long after she taught her. Anne married John Macy in 1905, and her health started failing around 1914. Polly Thompson was hired to keep house. She was a young woman from Scotland who didn't have experience with deaf or blind people. She progressed to working as a secretary as well, and eventually became a constant companion to Keller. Keller moved to Forest Hills, Queens together with Anne and John, and used the house as a base for her efforts on behalf of American Foundation for the Blind. After Anne died in 1936, Keller and Thompson moved to Connecticut. They traveled worldwide and raised funding for the blind. Thompson had a stroke in 1957 from which she never fully recovered, and died in 1960. Winnie Corbally, a nurse who was originally brought in to care for Polly Thompson in 1957, stayed on after Thompson's death and was Keller's companion for the rest of her life. Keller went on to become a world-famous speaker and author. She is remembered as an advocate for people with disabilities amid numerous other causes. She was a suffragette, a pacifist, an opponent of Woodrow Wilson, a radical Socialist, and a birth control supporter. In 1915, Helen Keller and George Kessler founded the Helen Keller International (HKI) organization. This organization is devoted to research in vision, health and nutrition. In 1920, she helped to found the American Civil Liberties Union (ACLU). Keller and Sullivan traveled to over 39 countries, making several trips to Japan and becoming a favorite of the Japanese people. Keller met every US President from Grover Cleveland to Lyndon B. Johnson and was friends with many famous figures, including Alexander Graham Bell, Charlie Chaplin, and Mark Twain. Keller was a member of the Socialist Party and actively campaigned and wrote in support of the working classes from 1909 to 1921. She supported Socialist Party candidate Eugene V. Debs in each of his campaigns for the presidency. The last sentence refers to prostitution and syphilis, the latter a leading cause of blindness. One of Keller's earliest pieces of writing, at the age of eleven, was The Frost King (1891).There were allegations that this story had been plagiarized from The Frost Fairies by Margaret Canby. An investigation into the matter revealed that Keller may have experienced a case of cryptomnesia, which was that she had Canby's story read to her but forgot about it, while the memory remained in her subconscious. At the age of 22, Keller published her autobiography, The Story of My Life (1903), with help from Sullivan and Sullivan's husband, John Macy. It includes words that Keller wrote and the story of her life up to age 21, and was written during her time in college. Keller wrote The World I Live In in 1908 giving readers an insight into how she felt about the world. Out of the Dark, a series of essays on Socialism, was published in 1913. Her spiritual autobiography, My Religion, was published in 1927 and re-issued as Light in my Darkness. It advocates the teachings of Emanuel Swedenborg, the controversial mystic who gives a spiritual interpretation of the Last Judgment and second coming of Jesus Christ, and the movement named after him, Swedenborgianism. On September 14, 1964, President Lyndon B. Johnson awarded Helen Keller the Presidential Medal of Freedom, one of the United States' highest two civilian honors. In 1965 she was elected to the National Women's Hall of Fame at the New York World's Fair. Keller devoted much of her later life to raising funds for the American Foundation for the Blind. She died in her sleep on June 1, 1968 at her home, Arcan Ridge, located in Westport , Connecticut . A service was held in her honor at the National Cathedral in Washington, D.C. and her ashes were placed there next to her constant companions, Anne Sullivan and Polly Thompson. In 1984, Helen Keller's life story was made into a TV movie called The Miracle Continues. This film that entailed the semi-sequel to The Miracle Worker recounts her college years and her early adult life. None of the early movies hint at the social activism that would become the hallmark of Keller's later life, although The Walt Disney Company version produced in 2000 states in the credits that she became an activist for social equality. The Bollywood movie Black (2005) was largely based on Keller's story, from her childhood to her graduation. A documentary called Shining Soul: Helen Keller's Spiritual Life and Legacy was produced by the Swedenborg Foundation in the same year. The film focuses on the role played by Emanuel Swedenborg's spiritual theology in her life and how it inspired Keller's triumph over her triple disabilities of blindness, deafness and a severe speech impediment. On March 6, 2008, the New England Historic Genealogical Society announced that a staff member had discovered a rare 1888 photograph showing Helen and Anne, which, although previously published, had escaped widespread attention. Depicting Helen holding one of her many dolls, it is believed to be the earliest surviving photograph of Anne. In 1999, Keller was listed in Gallup's Most Widely Admired People of the 20th Century. In 2003, Alabama honored its native daughter on its state quarter. The Helen Keller Hospital in Sheffield, Alabama is dedicated to her. There are streets named after Helen Keller in Getafe , Spain and Lod , Israel . On October 7th, 2009, a statue of Helen Keller as a seven year old child standing at a water pump was unveiled at the United States Capitol building. The statue is one of the State of Alabama's contribution to the Capitol's statuary hall. The statue represents the seminal moment in Helen Keller's life when she understood her first word: W-A-T-E-R, as signed into her hand by teacher Anne Sullivan. This statue is billed as the first one of a handicapped person and the first one of a child displayed at the U.S. Capitol. However, the Franklin Delano Roosevelt Memorial depicts the wheelchair-bound former president in a 7.5 acre tract of land in Washington, D.C. about 2.5 miles from the Capitol building. The life of Helen Keller, Royal National Institute of Blind People, last updated November 20, 2008. Retrieved June 17, 2009. Newly Discovered Photograph Features Never Before Seen Image Of Young Helen Keller, New England Genealogical Society. Retrieved March 6, 2008.